Redding bed and breakfast travel guide for romantic, historic and adventure b&b's. Browse through the iLoveInns.com database of Redding, California bed and breakfasts and country inns to find detailed listings that include room rates, special deals and area activities. You can click on the 'check rates and availability' button to contact the innkeeper. Redding is the county seat of Shasta in Northern California. If you are planning on an interesting weekend getaway, you will be surprised as to how much Redding can offer. Designed by the famous Spanish architect/engineer Santiago Calavatra, visit the amazing Sundial Bridge at Turtle Bay at Turtle Bay Exploration Park which is along the Sacramento River. Along with the Sundial Bridge, inside the exploration park is also a museum and a 20-acre garden. Try visiting historic Cascade Theatre which started operating in 1935 and is a great example of Art Deco architecture. The theatre is listed on the National Register of Historic Places. 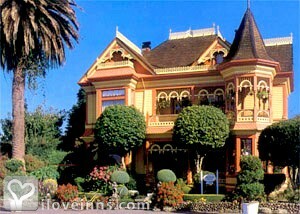 To complete your stay, try any of the Redding bed and breakfast inns. By Mount Shasta Ranch Bed and Breakfast.